Synopsis: MARK AND LILY HAVE BEEN BANISHED from Agora, the ancient city-state where everything is for sale – memories, emotions – even children. Lost and alone they discover Giseth, a seemingly perfect land where everyone is equal, possessions are unknown, and Lily believes they will find the secret of their entwined destiny. But paradise comes at a price. Why are their new friends so scared? What hides deep in the forest? And who is the mysterious woman who appears in their dreams, urging them to find the Children of the Lost? The Children of the Lost is in some respects very different from the Midnight Charter. But it is also achingly similar; a beautiful tale that culminates in a fantastic and awe inspiring way, something that David Whitley seems incredibly apt at. 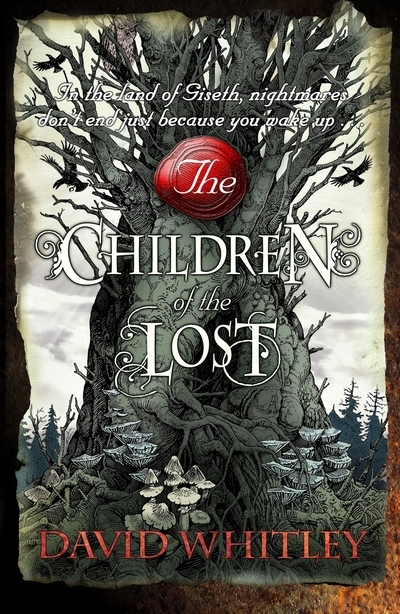 Children of the Lost starts off much like a standard fantasy, but what it becomes is something very different. Just like the Midnight Charter, it continues the underlying theme of the search for truth. And while the first three quarters are standard fantasy as it were, it is very well written, thought out and envisioned: a very impressive second novel. What really makes The Children of the Lost stand apart from standard fantasy is its themes, its driving morals and story. These are beautifully incorporated, particularly towards the end, and the make the end one of the best I have ever read; a mixture of happy and sad. Bittersweet. Judging it as a standard fantasy, it is also very impressive. The characters -as I mentioned in my review of the Midnight Charter – are great, and none are black and white; we can see both good and bad sides to each and every character, and this is very realistic. There’s also a whole new cast. While we do get to see the characters from book one, most of the book takes place in Giseth, where David Whitley manages to create a whole new culture just as well as he did with Agora. That leads on to another point- the world it is set in. Agora was a fantastically realised city and culture, full of depth, and Giseth and the lands beyond are not any different. Within Giseth, David Whitley has introduced a type of dream-walking, which reminded me of Hermione’s Time Turner in Harry Potter. It doesn’t feel like it’s plagiarised, though, and the dream-walking is also very different to that in Harry Potter. David Whitley writes in a very fluid and beautiful way; it’s very easy to get into, and at the same time it is full of description and detail. This makes it easy to read, and yet full of information, a fantastic combination. His writing style is also oddly beautiful. As the book culminates, grief is portrayed in a beautiful way, and the epilogue is fantastically written. I can only say that David Whitley is a very talented man. Again, it’s the marketing that let’s it down; while the cover is very beautiful, the tagline just doesn’t seem to portray the book well enough, and the blurb is not intriguing, even for me – and I loved the Midnight Charter. Otherwise, The Children of the Lost is an inventive, well written sequel to a great debut novel, every page oozing with beautiful story telling. The ending is particularly profound, and the best ending I have ever read. In a way, it reminds me very much of the Lord of the Rings; bittersweet. What did you think about The Children of the Lost?